La Regenta is a language school and italian-spanish cultural association. We are right in the center of Bologna, below the famous two towers and two minutes walking from the University, the oldest of the world. The area is the epicentre of the cultural life of cthe city, full of yougsters and students, with many monuments, theaters, museums, art galleries and cafes. We offer language courses, especially spanish and italian for foreigners. We propose several solutions in order to meet students'needs. Individual and group courses, official exam preparations (DELE and CILS), all levels of the CEFR, business courses. Our mother tongue teachers are competent and they possess a wide teaching experience. We endeavor to offer an effective teaching in line with state of the art methodologies, by means of the most up to date didactic material and the use of audiovisual devices. At the same time, we try to make learning funny, because we think that amusement is a fundamental aspect in any kind of learning process. For this reason, we created an informal and cozy environment, in such a way that the student can feel as much as possible at home! We collaborate with several schools in Spain for study trips. 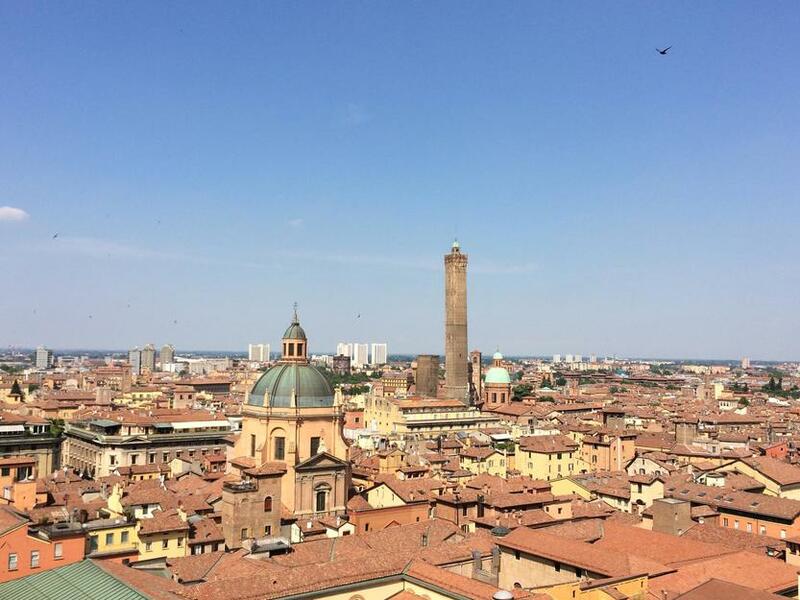 For students coming from abroad, we take care of accomodation in Bologna and we organize many activities, trying to make their learning experience and their staying in our beautiful city pleasant, funny and complete. The bi-weekly courses consist of two lessons of 2 hours and are thought for persons who plan a longer stay in Bologna, for university students or foreign workers who can dedicate a longer time to the study of our beautiful language. Even in this case, lessons are structured in order to involve all the abilities identified by the CEFR (reading and listening comprehension, written and oral production), highlighting at the same time the fundamental role of communication and of the cultural environment, also by means of the use of interactive material. Our intensive courses represent a real linguistic and cultural full-immersion, with a number of hours that allow to cover all the aspects of the Italian language: grammar, listening, written and oral communication, as well as customs and traditions...everything through practical and concrete situations, with the use of interactive material. With these courses the student will be able to reach very good results in a relatively short time, since our method envisages the use of Italian language for all levels, so that the student can familiarize from the very beginning with the language of the cultural environment. With the same structure of the intensive courses, the mini group courses are thought for a group of 3-4 students that will receive a tailored attention by the teacher, with a program that can be adapted to various needs and a flexible planning on both contents and schedules. It is the ideal course for a little group of students who require a course tailored to their needs, a course that lies in between an intensive group course and individual lessons, both for professional necessities and for study reasons. A semi-intensive course that consists of 3 hours on Saturday morning, thought for those who cannot attend lessons during the week. A course with a more “relaxed” frequency that allows the student to approach the Italian language, also by taking part in the several cultural events organized in our city during the weekend that will be recommended to the student by the teacher. Our bi-weekly courses are a big success since many years and are thought for all those who require a structured spanish language course, from beginners to advanced under the supervision of an expert and skilled teacher. Our students are professionals belonging to different sectors but also students who want to spend some of their free time to spanish language, for personal or study reasons. Lessons are strctured in a way that allows to envisage all the capabilities required by the CEFR (reading and listeningh comprehension, written and oral production), highlighting the fundamental role of communication and of the spanish cultural environment, so that learning by students is made funny and dynamic. It follows the model of the bi-weekly courses, but is intended for those who want to learn the spanish with a more relaxed schedule and have a first approach with the language. For those who want to travel around Spain with a basic knowledge of the language. For university students who, in an academic year with us parallel to their university studies, will reach a good knowledge also through a final course exam and a certification of frequency. A &quot;semi-intensive&quot; course with 3 hours of lessons on saturday morning, for those who cannot atted courses during the week and want to approach the language with a different timing, even of the program of the course is exactly the same as the bi-weekly courses. The ideal sequel of this course, after the final examination and the certificate, is a study trip to Spain: the student will infact acquire the knowledge corresponding to an A2 level of the CEFR. A novelty of this year that was a big success, our intensive courses represent a real linguistic and cultural full immersion, with a number of hours that allows to cover all the aspcets of spanish language: grammar, listening, oral and written communication, but also culture and tradition (with a focus on history and literature, idiomatic expressions, but also gastronomy and folklore...), everything through practical and concrete situations, with the use of interactive material. With this course the student will obtain optimal results in a very few time, firmly advancing to reach the following level with a process that consists in 4 academic hours from monday to friday (80 hours). We offer to a group of 3-4 person the possibility to choose a mini-group course. At a relatively cheap price, this course allows to cover a personilized prgram on the model of courses for two (SEE TAILOR MADE SPANISH COURSES). CILS courses consist in a specific preparation with the simulation of exam sessions: for those who need, for reasons of residency permit or study/work, to take the official examination in the times and ways indicated by the University of Siena. In our school, the students will find a personalized process both on frequency (minimum two weeks) and on contents in order to deal with this proof in the best way. La Regenta will accompany the student in this process with skilled teachers, practical advises on the examination and useful information on textbooks, culture and the levels to be reached. Our school offers since many years specific courses for the official examination of spanish as a foreign language (DELE). Expert and skilled teachers will guide you through a process that includes, from one side, a deep study of the language and, from the other side, a simulation of exam sessions for every level. After five years of teaching, we had 100% of success: with our courses all the students passed the DELE examination brillantly. Group courses for the B1, B2 and C1 levels will start a couple of months before the official exam sessions, with a structured process that consists in 30 hours of classroom lessons. It is possible to combine a group coruse intended to reach a given level with the 30-hour specific DELE course with a personalized quotation. In addition, individual lessons completely tailored on students's needs are available all year long . A &quot;one-of-kind&quot; course, given only by our school, this courses is thought for those students of the university of Bologna to go to Spain with the Erasmus progam and need a level that goes from A2 to B1/B2 depending on the spanish university. It is a semi-intensive or intensive course with a completely specific program . After the final examination, students will receive our certificate, accepted by most of the spanish universities. With a wide experience in this field, our school organises since many years individual or group courses for those students who have to take the september exam to pass from the scientific to the humanistic/linguistic field. A personalized course also for those students who did not pass the spanish exam during the school year and have to take the exam in september. Courses for academic preparation are thought for foreign students who have to face life in an italian university and have to take examinations, but also for researchers and professor who come to Italy for a period of visting. Lessons consist in a general part of knowledge of italian grammar and a part tailored on academic preparation, in particular in the fields of law, economy and medicine. Courses can be structured based on students' needs and can take the form of bi-weekly or intensive courses (see GENERAL ITALIAN) or even individual lessons (see TAILOR MADE ITALIAN COURSES). This course is delivered through Skype. With a Skype video call the student will access a real classroom where he will have a lesson with a teacher. The course covers all the aspects of the learning process: grammar, listening, oral and written production, tought by a mothertongue teacher. Professional courses are thought for those people who need to learn or deepen their knowledge of italian for working reasons. Depending on the level, lessons consist in a general part of study of the italian grammar and a a part based on professional needs, especially in the economic, legal and medical fields. In order to meet working schedules, the courses are generally structured as bi-weekly courses, courses on saturday morning, or individual lessons. One of our big successes, the individual lessons consist in a teaching completely tailored to student’s needs, with a process constantly supervised by the didactic direction, so that the student can receive a quality training respecting his timing and professional needs (legal, medical, touristic, economic...but also translation and conversation). Individual lessons are thought for the students who, for any reason, are not able to attend a group course or have short deadlines or the need for a tailored learning, through a package of hours shaped on the single cases. La Regenta gives the possibility to attend a highly personalized Italian course for 2 persons (a couple, two friends, two colleagues...) that have a common learning target and the same time availability. An expert teacher will follow the students, with a specific course program thought for the concrete needs of professionals or students that desire learning quality and speed. SInce many years one of our big successes, individual lessons consist in a course completely tailored on students'needs, with a process constantly supervised by the didactic direction, so that the student receives form our teachers a a quality teaching in line with the working and study needs (legal, medical, turistic, economic...but also translation services and conversation). These lessons are intended for whom, for any reasons, cannot attend a group course or have short deadlines or the need of a specific learning, through a package of hours based on the single cases. Ho frequentato un corso in preparazione all'esame DELE C1 e sono stata molto soddisfatta. La Prof.ssa Agripina si è rivelata molto professionale, ma anche disponibile e sempre pronta a offrire aiuto e consigli. Il numero ridotto di studenti per classe permette di interagire meglio durante le lezioni e di perfezionare tutti gli aspetti della lingua. Nel complesso, La Regenta si è dimostrata un'ottima scelta. Sicuramente consigliata. Dovevo dare un B1 di spagnolo e laurearmi, alla Regenta (oltre ad essere carini, gentili e disponibili) mi hanno preparato proprio bene! Non mi è mai pesato andare a lezione, i corsi sono stati istruttivi e divertenti, ma il centro fa tutta una serie di iniziative interessanti legate alla cultura spagnola- danze, teatro...- che vale la pena conoscere! Straconsigliato! Trasferimento professionale imminente in Spagna e non una parola di spagnolo. Con un corso intensivo, grazie alla proverbiale Agripina, direttrice e docente accorta, in un solo mese sono stato in grado di raggiungere un livello di comprensione quasi totale e una capacità di esposizione verbale sufficiente per poter cominciare a lavorare a Barcellona. Docenti madrelingua, posizione centralissima della scuola e come nelle migliori sartorie riescono a cucire l'abito giusto a seconda delle tue esigenze. Le attività scolastiche e para scolastiche sono numerose e la scuola dispone inoltre di un'ottima bibliioteca disponibile per gli studenti. L'esperienza nella scuola La Regenta di Bologna è stata assolutamente positiva sia dal punto di vista umano che da quello dell'apprendimento, tanto che adesso non ho assolutamente alcun problema ad esprimermi in spagnolo in modo fluente. Il corso è stato organizzato bene e ben predisposto. L'insegnante molto brava e cortese.